California Design Den began in India over a decade ago and currently design their sheets and run the company from California. They recently contacted me asking to review their sheets and write about it on Essential Home and Garden. So they sent us a sample of their 400 thread count sheets to write an honest review on. And were these sheets any good? 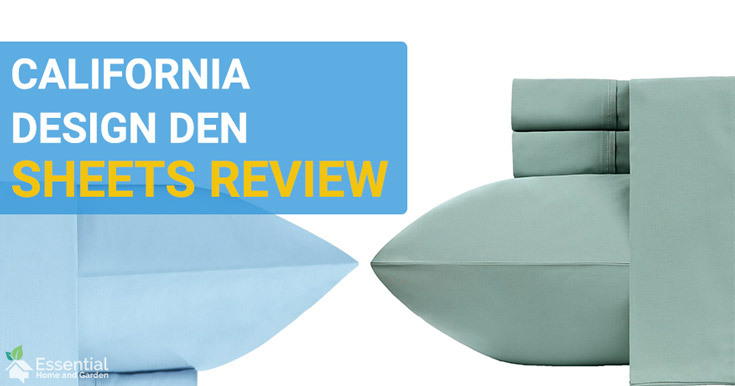 Well, read on for our California Design Den sheets review. It is obvious that California Design Den have put a lot of effort into producing quality sheets. 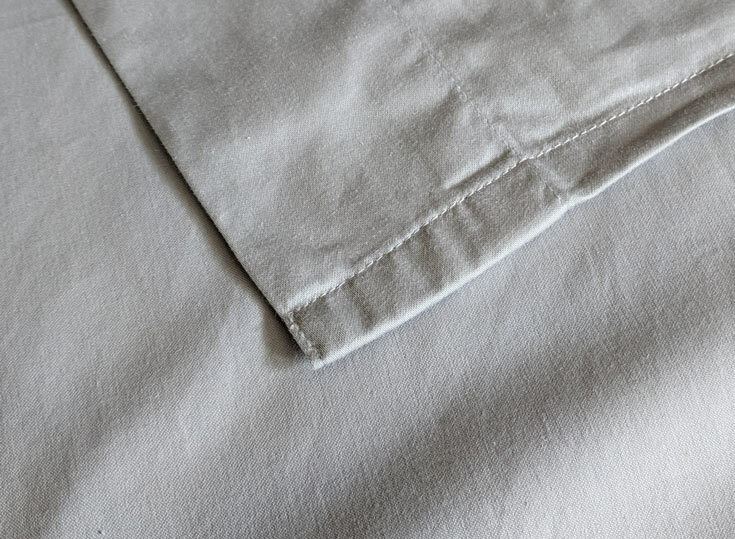 From the luxurious feel of the cotton through to the ethical manufacturing process - despite the great price, these linens are some of the best we have tried. The only let down is the fact that there seems to be no warranty offered beyond the 30 day satisfaction guarantee. Gone are the days of those old school thin mattresses, most decent quality modern mattresses have a reasonably deep pocket on them. And one of the most annoying problems with poorly designed sheets is that they simply don’t fit properly on a modern mattress! 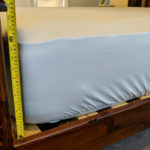 Well, this is no NOT a problem for the California Design Den sheets – they can be fit onto almost any mattress easily up to a pocket depth of 18”. 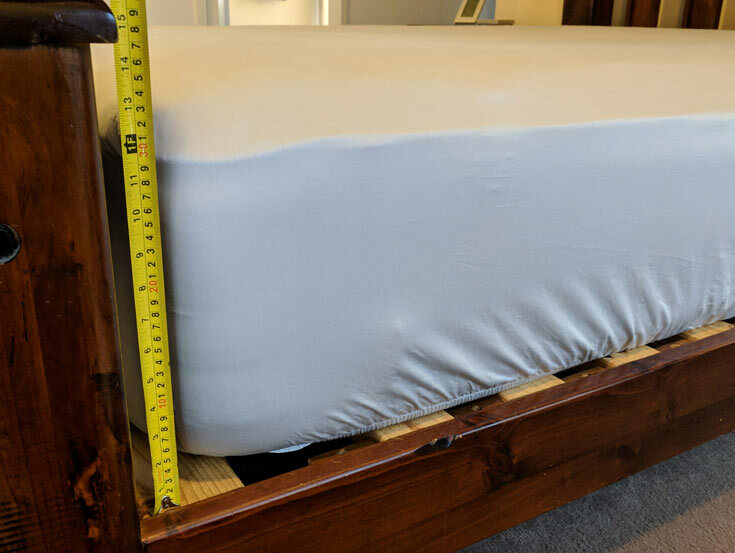 I don’t know about you, but for queen size mattresses and larger, I always have trouble working out which end is the top/bottom of the fitted sheet! 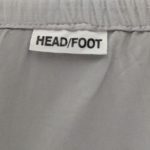 Well this problem is eliminated with these sheets by another handy design feature known as the “Smart Tag” that is on the top/bottom of the fitted sheet. This makes it easy to quickly orientate the sheet the correct way – the first time! I also noticed that once the fitted sheet has been put onto the mattress, it barely moved even after two adults sleeping on it for a night. So when it came to making the bed each morning, there was no need to restretch and refit the fitted sheet. The pattern and color range that the sheets are available in also amazed me – if you can’t find something to match your decor in this sheet range, then you might as well give up now! And while we are on the topic of how the sheets look – they look great! The sheen that they have on them makes them look (and feel) seriously luxurious. Another nice touch was the fact that the sheets came with a printed card that detailed exactly how to wash and dry your sheets so they stay as unwrinkled as possible. As far as the quality of the materials used to manufacture these sheets go, they are top notch. Made from 100% pure cotton, there really is nothing to complain about here. 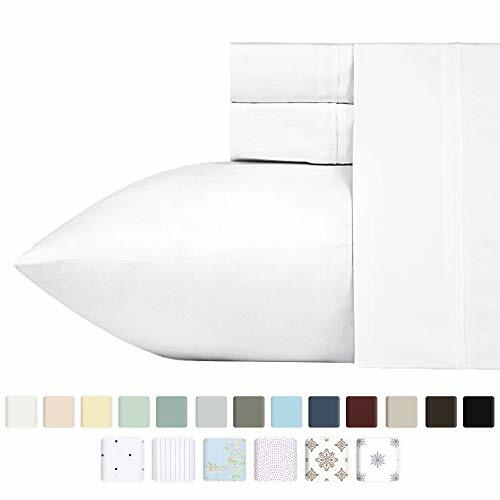 The colors look vibrant and great and continue to do so wash after wash.
And you know how some sheets feel like they are going to rip when you pull the fitted sheet over those deep pocket mattresses? Well, not with the California Design Den sheets – never once did they feel like they were going to give way and the elastic is top quality too. Despite this strength, they still managed to stay soft and comfortable even after multiple washes. And by all reports from long term customers, they will continue to do so for many years to come. If I really wanted to find something to complain about here (and I am really stretching for this one) then the only problem with the materials is that they do wrinkle a bit more than some people may like. BUT, that is due to the fact that they are made from pure cotton – so it really is unavoidable. Without trying to be cruel, seeing the words “Made In India” did not give me the greatest confidence. But I was very happy to be pleasantly surprised. These sheets are certified standard 100 by OEKO-TEX and made in a factory that uses the most modern machinery and utilizes labor in an ethical way. If you have used 400 thread count sheets before, then you may think that these sheets would be quite light. 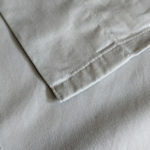 But, due to the fact that this linen uses 3 ply thread and the quality of the cotton is so high, you would swear that the thread count is much higher than that. For me, comfort is THE most important thing when it comes to bed linen. And I was not let down by the California Design Den brand. The sheets are soft and smooth, and have an almost silky feel but without the slipperiness of satin. 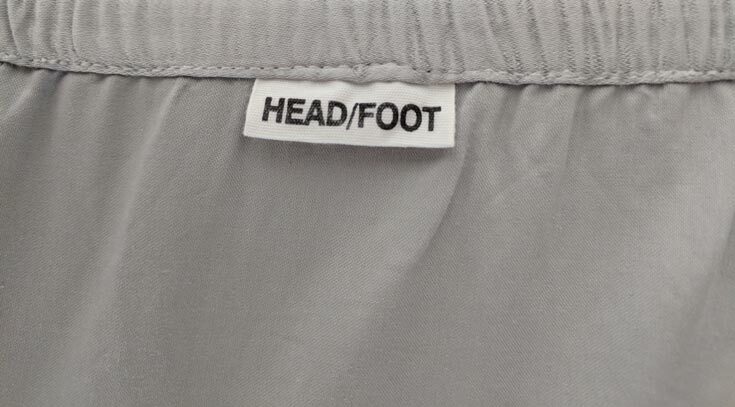 The weight of these sheets is about perfect for me. They are cool in summer and warm in winter – they also breathe remarkably well thanks to the high quality pure cotton. This linen remains soft wash after wash – and are great for every day use. You souldn’t need to replace them for many years. Now if you look online, there are many 400 thread count sheets that are cheaper than the California Design Den linen. But I can tell you know, you won’t get better value for money anywhere else. The quality is A+ the comfort is amazing and you will swear these sheets should have cost you over $100! 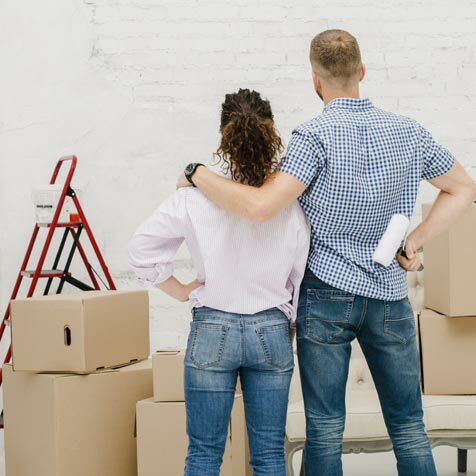 A 30-day satisfaction guarantee that means if you are unsatisfied with your purchase you can return them to the manufacturer within 30 days for a refund. I did ask California Design Den CEO Deepak Mehrotra what sort of warranty comes with the sheets. He referred me to the 30-day satisfaction guarantee and then to the return policy and FAQ on their website. From what I can see there is NO warranty after that 30 day period…so while I don’t expect you will need it, it is important to be aware of this. There is no doubt that the quality of the sheets is very good and they are 100% worth the price. In my opinion these sheets are a great buy. As I mentioned though, the warranty period against manufacturing defects seem to be very short. And while I think the instances where these defects appear would be very small )due to the quality of materials and manufacturing) it is worth keeping in mind.